The hotel also offers extensive recreational options including soothing beauty treatments at the Remède Spa, a gorgeous 50m olympic-sized outdoor swimming pool, and a gym that contains a plethora of equipment and facilities such as a sauna, steam room and steam showers. My room was beautifully decorated and contained the most perfect of beds and the most delicious of pillows, all of which were made up with the finest crisp-white Egyptian cotton sheets. Each room also has access to a bespoke 24-hour butler service that was impeccable, as well as amazing views of the beautiful Persian Gulf. 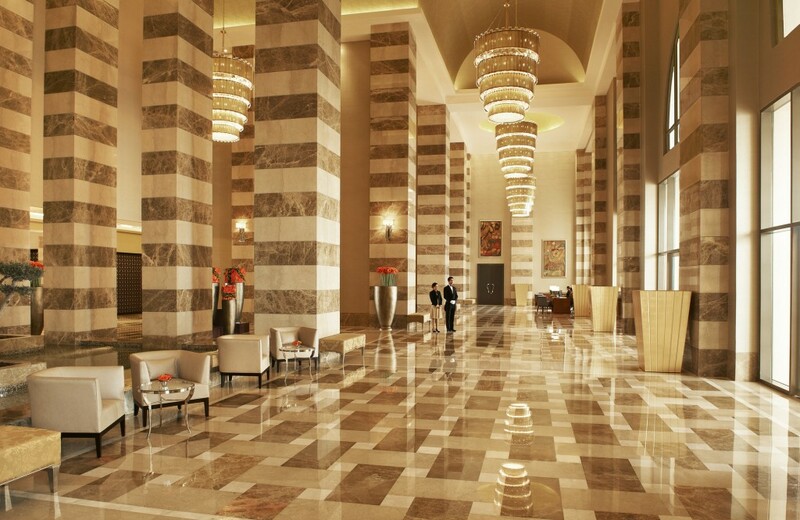 Rooms start from about QAR1,100 (about £200), which is amazing value when you consider the standard of finish of the hotel, and a service that provided the most complete and satisfactory of stays. And then there are the dining options. There are about ten restaurants at The St Regis including the French Astor Grill, the Hakkasan which serves Chinese food, the Al Sultan Brahim which serves Lebanese food, and a Caribbean inspired Oyster Bar. There is also Jazz at the Lincoln Centre, a restaurant and club that offers a New York style ambience with jazz musicians. Gordon Ramsay also lends his name to two of the restaurants at The St Regis Hotel. One is Gordon Ramsay, the fine dining venue, and the other is Opal by Gordon Ramsay, which was awarded the Best Contemporary European Restaurant by Timeout for 2013. 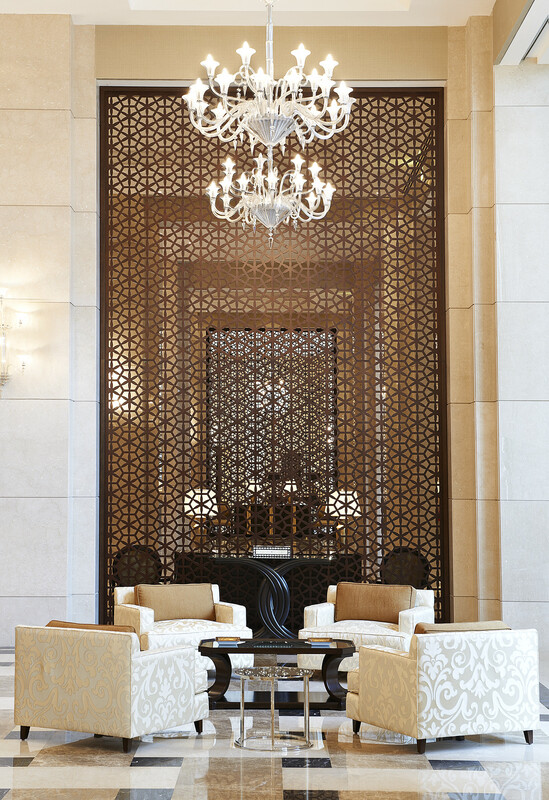 On Fridays and Saturdays, the Islamic weekend, Opal operates an all you can eat à la carte brunch menu from 12 to 4pm. The beauty of this over a buffet is that ordering off the menu means that everything is cooked à la minute to ensure maximum freshness. The menu is divided into four sections: breakfast items including eggs, starters, mains and desserts, and each section contains about five to six items. Portion sizes are small so once you decide on the dishes you enjoy the most you can reorder them as many times as you like. 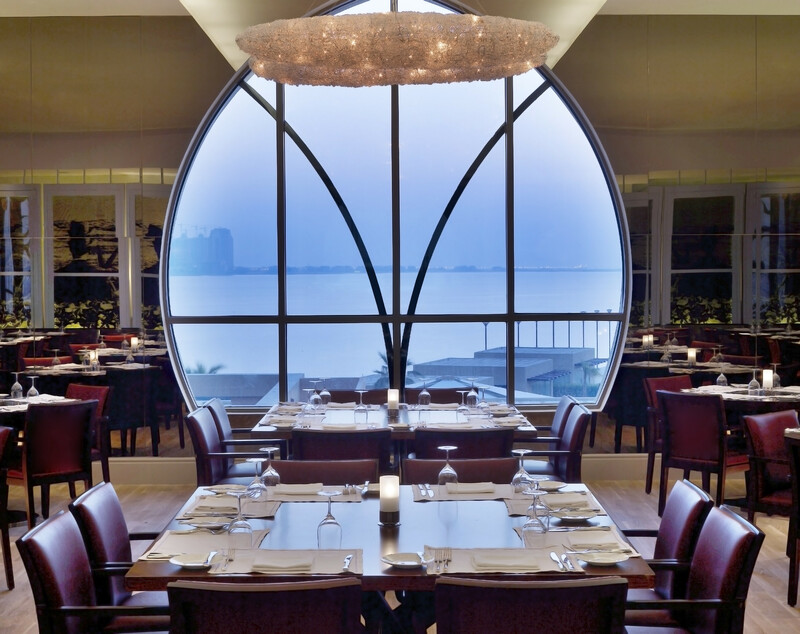 Per person, the brunch menu with soft beverages is priced at QAR250 (about £45); with selected beer, wine and sparkling wine, it is QAR375 (about £67); and with selected beer, wine and a bottle of Jean Paul Deville champagne, it is QAR625 (about £112). 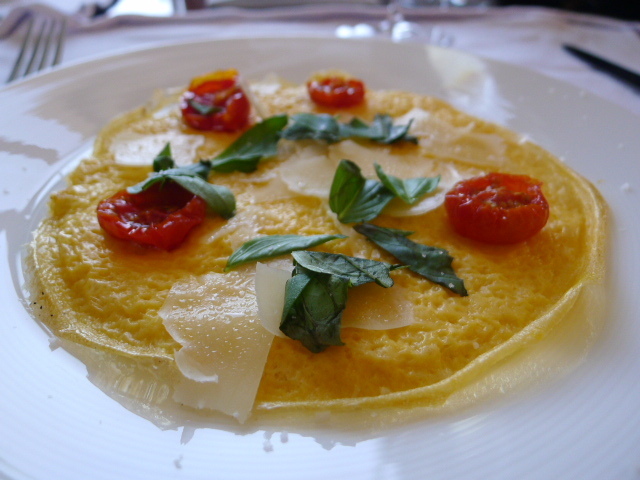 From the breakfast section, an omelette was made beautifully fragrant from the use of lots of fresh basil, and sweet from some fresh, juicy cherry tomatoes. The omelette on its own was pleasant but a touch over done as it was quite thin. Tasty, but tt would have probably worked better had it been a little thicker and runnier. 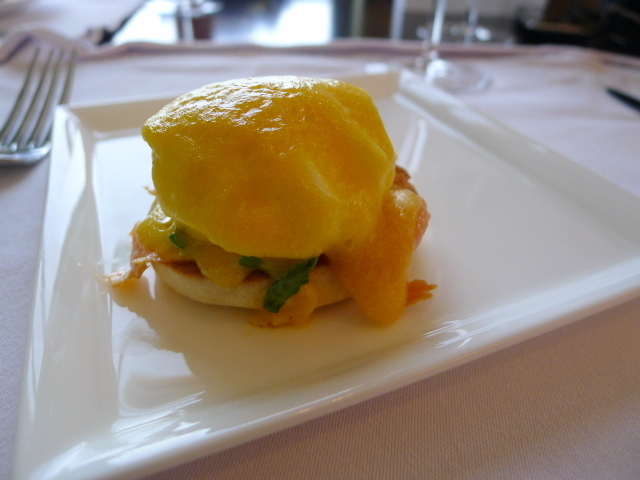 An egg benedict with smoked salmon was also delicious with a perfectly cooked poached egg that was runny in the middle, and a hollandaise sauce that was creamy with just a hint of acidity. The smoked salmon was lovely and this proved to be a super yummy dish. 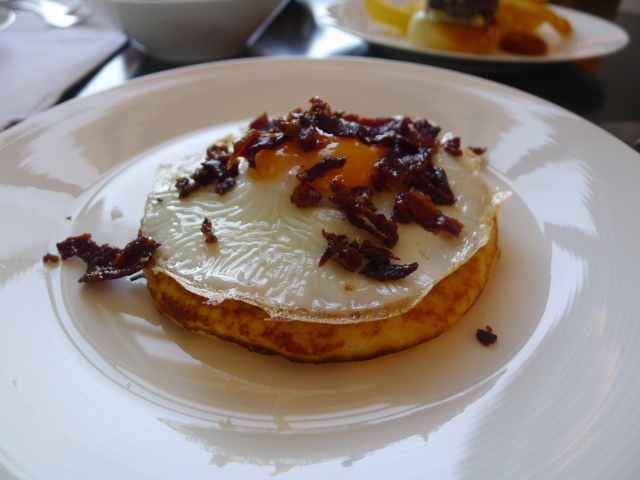 But the best of the breakfast choices was the fried egg with salted pancake, crispy beef bacon and mushrooms. The combination really worked with the pancake being light, fluffy and well judged for seasoning. The pancake was delicious, even when eaten on its own, and when combined with the runny egg and the saltiness of the bacon, the complete dish worked a charm. 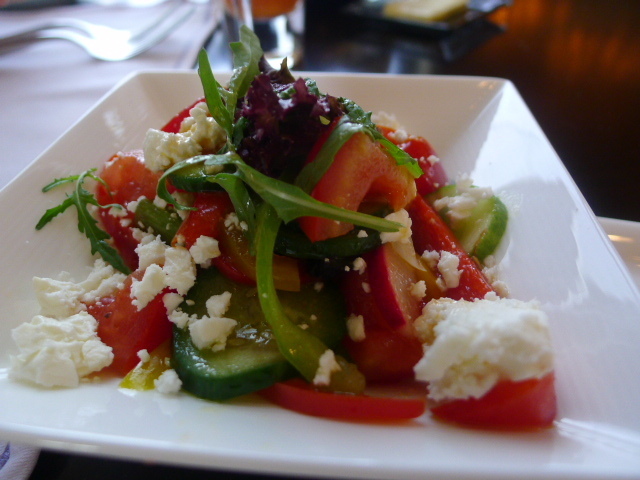 A nicoise and a Greek salad from the starter selection were both delicious with good seasoning and dressings that were well judged for acidity. 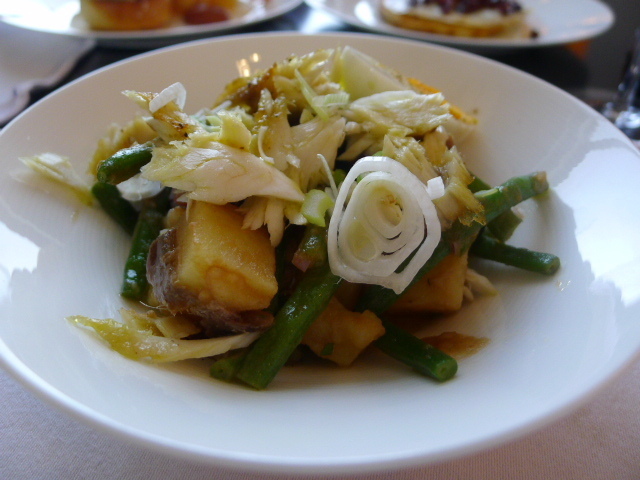 The nicoise made use of butterfish instead of tuna that had been nicely grilled to remain crispy. Crab cakes served with a lovely Thai mayonnaise had a good crab flavour and were beautifully seasoned with a hint of chilli that gave way to a subtle after kick. 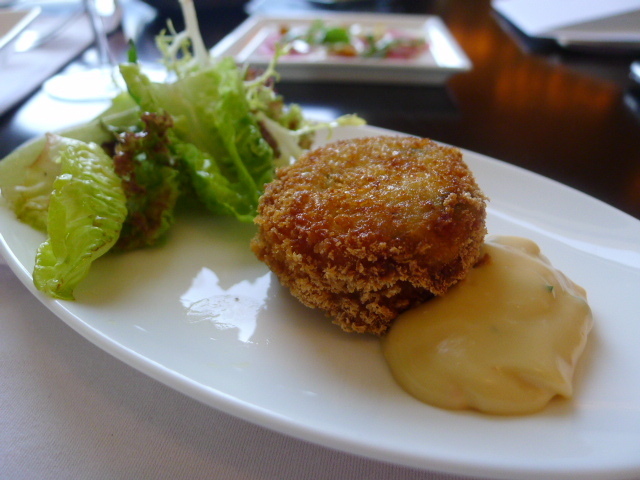 The coating was crunchy and this gave the crab cake another textural dimension. 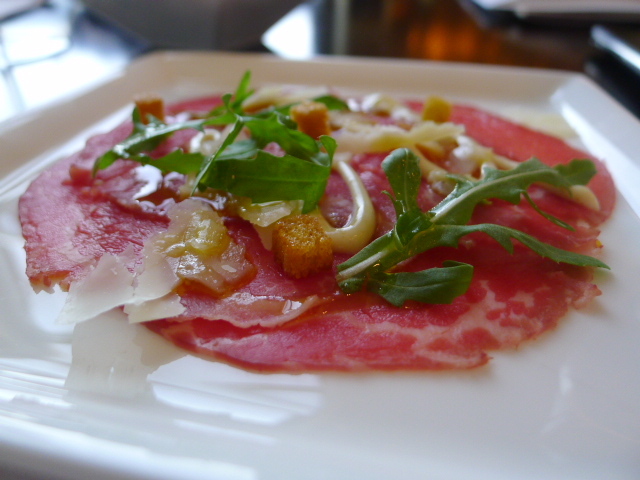 Beef caparccio with a rocket salad and parmesan cheese was also wonderful with some thinly cut sirloin that was ever so yummy. It was of the highest quality and so incredibly soft that it simply melted on the tongue. 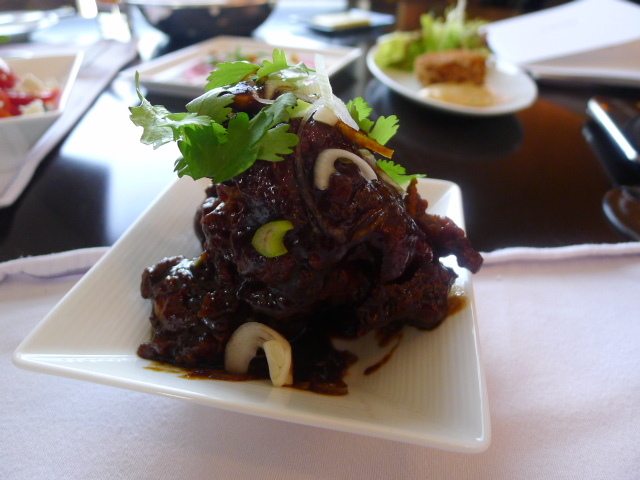 Some tamarind chicken wings with coriander and spring onions were reasonably tasty, although the sauce was a touch too thick. 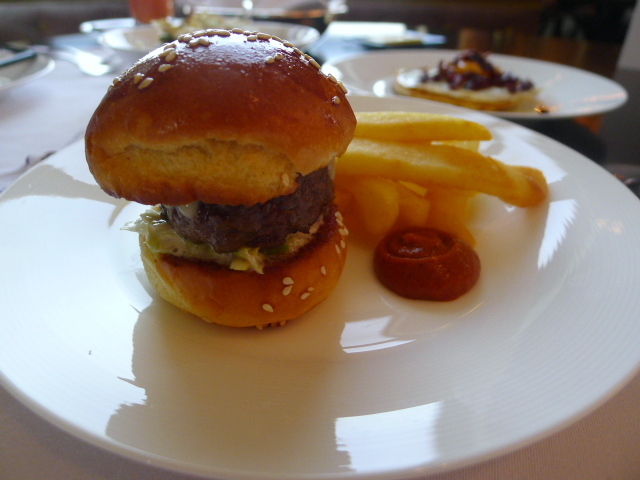 There were some wonderful main selections as well, and an ‘Opal’ mini-burger with Comte cheese came out on a sesame seed bun that was nicely toasted to a scrumptious finish. A side of homemade tomato sauce worked a treat and was wonderfully fresh and resplendent with tomato flavour. The patty was moist and tasty, and the use of Comte cheese gave the burger an added dimension. A side of fries were crispy and perfectly fried. 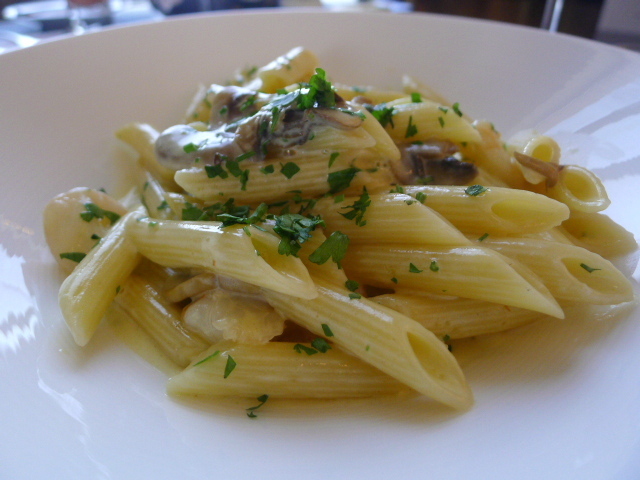 A shrimp penne in a creamy horseradish sauce was really interesting. The pasta had been cooked al dente, and the sauce gave way to gentle hints of horseradish that was both tasty and not at all overpowering. I loved the inspiration and the originality of this dish. A sea bass was fresh and beautifully cooked, and came with sautéed artichoke, a pesto sauce and a saffron aioli, all of which was nicely done. Because the fish is quite safe in taste, I would have liked more punchiness coming through from the accompaniments to give this dish a greater dimension. 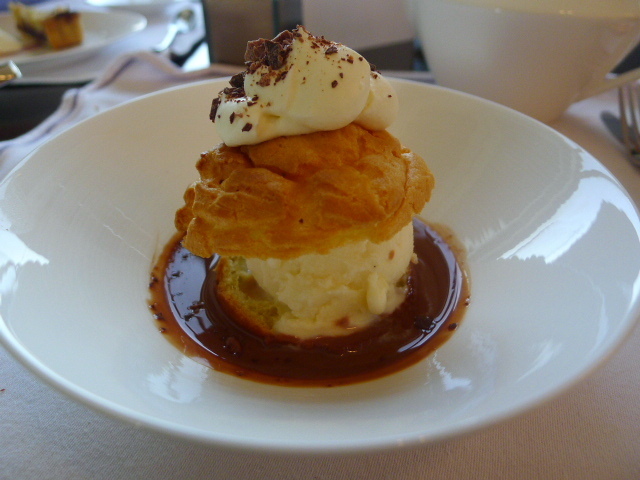 Of the desserts, a crêpe with a grand marnier cream was simply heavenly. 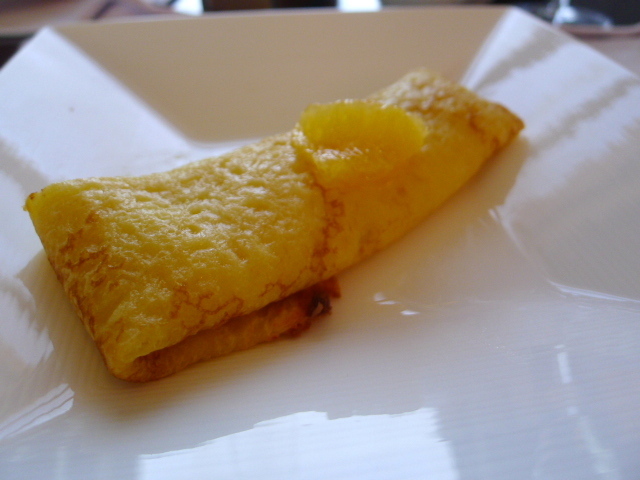 The crêpe was sliver thin, and when eaten with the beautifully light and silky smooth cream, it produced a result that was incredibly decadent on the palate. 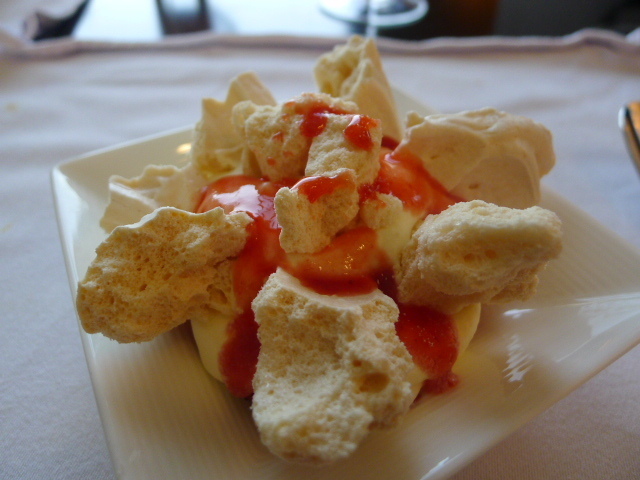 The rest of the desserts were tasty but not quite to the same standard, with the meringue in an Eton Mess being a little too hard, and the choux pastry in a chocolate profiterole being quite dry. 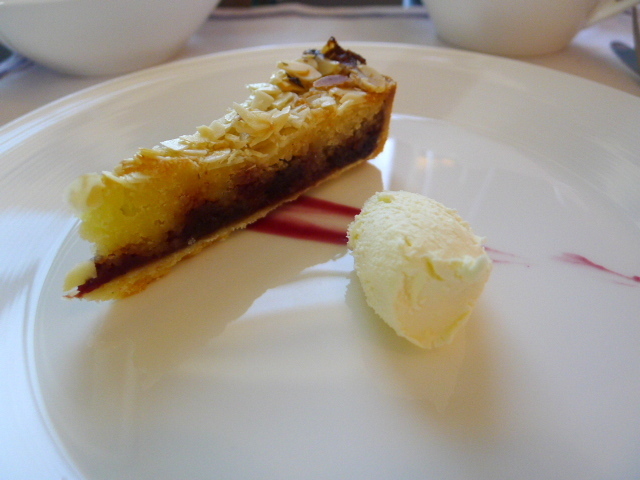 A cherry bakewell tart with clotted cream was passable but not amazing. There wasn’t quite enough acidity coming through from the jam, and the pastry too soft. 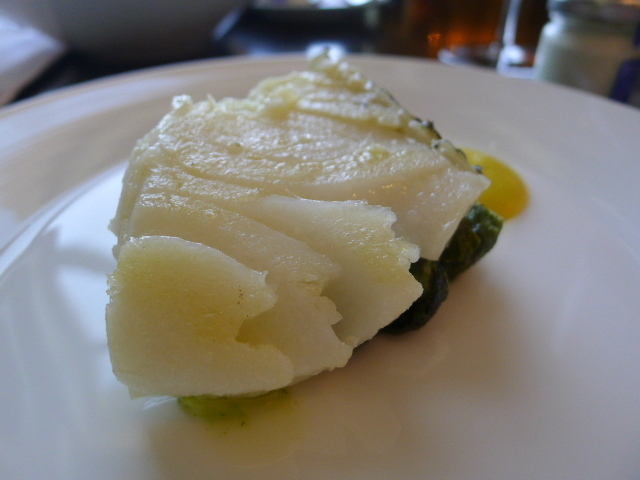 There was some really delicious food on show at Opal by Gordon Ramsay, and the variety the menu offered was fantastic. We tasted almost 20 different dishes, some of which were outstanding and which demonstrated an excellent level of execution. The savoury courses won the day over the desserts, but that said, the crepe was a knockout and well worth the extra calories when we went back for seconds. As everything was freshly cooked to order, it beat collecting precooked food kept warm in a buffet tray hands down. Furthermore, you got the variety of a buffet without the effort of having to leave your table. I loved the concept. It was fun, tasty and original. The service at Opal was polished and nicely tuned to mark a complete and well rounded experience. What a winning restaurant at a winning hotel. c) with selected beer, wine and a bottle of Jean Paul Deville champagne QAR625 (about £112). 360-Foodcourt is a digital platform catering to the restaurant industry that specializes in online food order and reservation bookings.